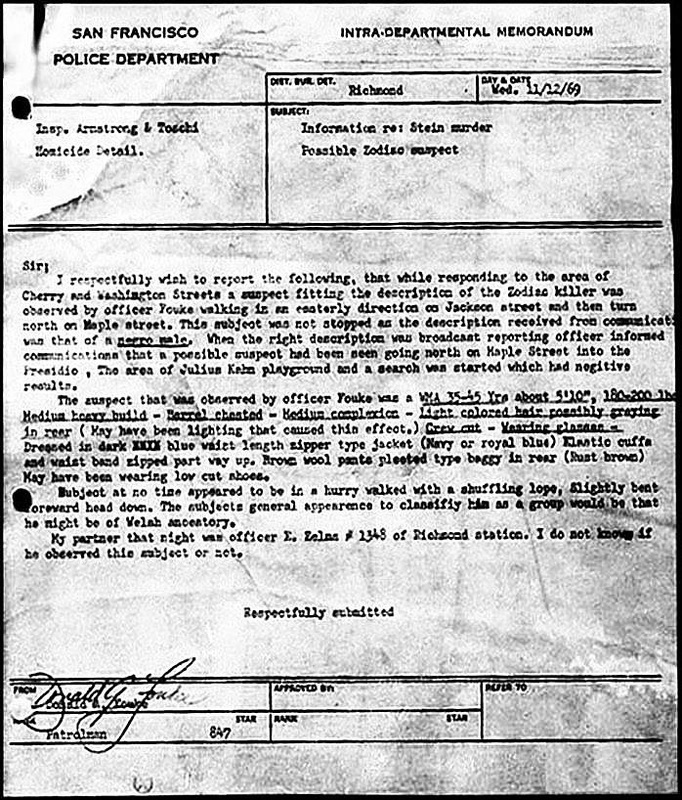 The Paul Stine police report contains a few anomalies that appear to contradict the view that Officer Donald Fouke somehow withheld his sighting of the unknown white male, observed walking along Jackson Street minutes after the murder of Paul Stine on October 11th 1969. This is depicted in the 2007 Zodiac movie, with Dave Toschi expressing consternation at the revelation that the two officers (Eric Zelms and Donald Fouke) had spotted the unknown white male, yet had subsequently failed to stop and question him. The sighting by Donald Fouke failed to make it into any newspaper reports in the following months, however, when the Zodiac Killer mailed the 'Bus Bomb' letter on November 9th 1969, stating "2 cops pulled a goof", three days later a typed Donald Fouke memorandum was issued on November 12th 1969 ratifying the sighting. Donald Fouke's description of the likely Zodiac Killer was a "WMA, 35-45 yrs, about 5'10", 180-200 lbs, medium heavy build, barrel chested, medium complexion, light colored hair possibly graying in rear, crew cut, wearing glasses. Dressed in dark blue waist length zipper type jacket (Navy or royal blue). Elastic cuffs and waist band zipped part way up. Brown wool pants pleated type baggy in rear (Rust brown). " Now here is the description given by the teenagers who observed the Zodiac Killer in and around the taxicab on Washington Street from a residence across the street. This link is from Zodiackiller.com and details their observations. "A white male, 25-30 years old, 5'8" to 5'9", stocky build, reddish-brown hair worn in a crew cut, heavy rimmed glasses and dark clothing." "#2 SUSPECT: WMA, in his early forties, 5'8", heavy build, reddish-blond, crew cut hair. wearing eyeglasses, dark brown trousers, dark (navy blue or black) "Parka" jacket, dark shoes. Suspect should have many blood stains on his person and clothing, suspect may also be in possession of the keys to the Yellow Cab, possibly has wallet belonging to the victim. Last seen walking north on Cherry Street, from Washington Street". So, who furnished this description in the police report. Since the last line stated "last seen walking north on Cherry Street, from Washington Street" and no future sightings of the suspect were mentioned in the report, one would have to assume the description came from the teenagers. However, the description in the police report appears a mesh of both Donald Fouke's description and the three teenagers. The teenagers stated "reddish-brown" hair, yet Donald Fouke in the memorandum stated "light colored" hair - to become "reddish-blond" in the police report. The teenagers recalled dark clothing, Donald Fouke recalled "brown wool pants" and a "zipper jacket" (navy or royal blue). This was meshed in the police report as "dark brown trousers" and the jacket as a "Parka", navy blue or black. Finally, the three teenagers described the suspect as 25-30 years, wildly different to the police report of a man in his "early forties", but much more in line with Donald Fouke's memorandum of 35-45 years. So who provided the information for #2 SUSPECT? If the police report is describing part of Donald Fouke's description that night, why has he not countersigned the foot of the report, along with Armond Pelissetti and Frank Peda, despite the fact his observations were apparently crucial to the investigation. We know Armond Pelissetti crossed paths with Donald Fouke that night - and it is highly likely that Donald Fouke shared his observations with Armond Pelissetti, but this should not detract from the fact that Donald Fouke should be pivotal to the Paul Stine police report. However, it is clear his description and observations did surface in the police report, either by his own hand or via Armond Pelissetti. The teenagers sketch of the Zodiac Killer was amended, with the second version showing a distinctly more furrowed, older portrayal of the first, and believed to have been revised by the teenagers, however, it is equally conceivable it was updated with input from Donald Fouke's sighting. Thirty-eight years later, Donald Fouke stated in the 2007 documentary 'This is the Zodiac Speaking' "When the composite drawing came out at Richmond Station and was posted on the wall, he looked similar to the man I had seen on October 11th. I then wrote a scratch or inner departmental memorandum to my lieutenant to forward to homicide division, so they would have the additional information about the appearance of the subject." He went on to say "I never spoke to Toschi that I personally know of or remember. He may have been the inspector who came out and asked me about the composite drawing and I told him the suspect was older and heavier, beyond that I had no further contact with the investigation." Despite this statement, there is nothing here that contradicts the notion he most likely informed his superiors of the suspect description the night of the crime. ​Since the suspect in the police report was supposedly last seen heading up Cherry Street, then presumably no input had been typed from the Donald Fouke encounter, as this was distinctly a later sighting. Therefore, we have to explain the discrepancy of the teenagers description of 25-30 years, radically changing to a man in his "early forties" on page 2 of the police report. This description could not be accredited to the three teenagers, unless we conceive the notion that the teenagers had a significant change of opinion, and reconstructed the original composite sketch to an older version with no external influence. ​The San Francisco Chronicle ran an article on October 21st 1969 entitled 'Lawmen Pool Their Zodiac Clues', continuing the theme that only three eyewitnesses had viewed the killer stating "Meanwhile police circulated a new composite drawing of the "Zodiac" suspect based on further questioning of the three witnesses to Stine's killing. He looks older with a heavier jaw. He is described as being 35-40 years." So, if this reporting is factually correct, the description is at least starting to sound more like Donald Fouke's description. ​But why would Donald Fouke's observations be contained, other than damage limitation, and the embarrassment of letting a suspect slip through their fingers? Despite this, superiors still felt compelled to incorporate his input into the composite sketch to aid in the capture of the killer, which was still foremost in their minds. On the flip side, the police department may have no ulterior motive in containing this encounter, wanting the public and newspapers to concentrate their efforts to apprehending the Zodiac Killer, as opposed to focusing their attention back onto the police department itself. The Donald Fouke memorandum was deemed a response to Zodiac's revelation of an encounter on Jackson Street, but equally they could have stayed quiet on the matter, simply dismissing Zodiac's claims - and nobody would be any the wiser. After all, Zodiac was deemed a liar and a psychopath by many. is donald fouke still alive?also who were the 3 teenagers and have they ever been reinterviewed years later thanks in advance. I haven't given a thought about the first question lately, but I believe he is alive. As for the Robbins kids (teenagers). I don't believe they have been officially interviewed, but here is a forum post of somebody having spoken to them subsequently. "I have talked to the Robbins kids extensively and they are a remarkable couple of kids. ...Some background... This is an upperclass neighborhood (Duh!) The Robbins father was (maybe still is) a renowned surgeon. At the time of the murder, the senior Robbins was about a block away attending a formal dinner at the Belgian Embassy. You can begin to get the status and education of the family. The kids (Lindsey and Rebecca were 16 and 13 Respectively) were having friends over for TV, Popcorn, games, etc. There was no alcohol as some have suggested. As both Robbons kids were the oldest, their statements were the given the most weight. Also they were the least traumatized by the event. One of the kids (not sure which) noticed a cab parked outside (in that now famous spot) with the interior lights on. (I have to insert my personal experiences here.. In the late 60's the American cars were large and roomy. I drove an identical police car many years ago and can tell you the interior dome light was very bright. It was even brighter when you removed the opaque plastic lens that covered the bulb. We (police) did it so we could more easily read/write reports in the car, and I noted that cabs also removed these lens covers for the same reasons: to be able to read/write reports, trip tickets, make change for passengers, etc. So when Lindsey told me that the light inside the car was like a spotlight, it was so bright... I knew what he meant (even though he didn't). We know now that Z was cutting off a large piece of Stein's shirt with the knife. At this time, lindsey went downstairs to get a better look at what was happening, while one of the kids upstairs called the Police. Downstairs, the lights were off, so Lindsey knew he could not be seen from the outside. He got close to the window and watched his actions. He was shortly joined by Rebecca. They both watched and observed in silence as Z pushed the driver to an upright position behind the steering wheel, exited the car and walked around the rear of the car and opened the drivers door. Stein had fallen over onto the seat and Z pulled him back up into the seated position and had some difficulty keeping him upright. Once upright, he was seen to have a rag, or something like a handkerchief and began to wipe down the door area and leaning over the driver, part of the dashboard. Whe he was finished, Z calmly walked to Cherry St. and walked North. Not many know this, but Lindsey (being 16. feeling immortal, and beleiving the susp to be armed with only a knife) ran out his door to see where Z was going. He ran to the corner of Cherry and watched as Z continued his casual pace right up to the corner of Jackson & Cherry. At this exact point, the first SFPD car arrives with two officers. One, Palesetti, approached Lyndsey and tried to extract what was happening. The other officer went to the cab and found the bloody victim. While Palesetti asking questions, Lyndsey was trying to explain that the susp was in sight on Cherry St. By the time Palesetti got the point, they both looked and the Z was gone. The assumption was Z continued North into Presidio Park and the resultant search extensively covered this area. Palesetti followed a different path East on Jackson in the event Z had turned East. What happened next is for another story. But, I want to tell you how the sketches came about. Within 48 hrs of the murder, Tochi had recruited a young uniformed cop named Juan Morales, who was said to be a good artist. He asked him to talk to the kids and see if he could work-up a composite of the susp. Morales sat down with all the kids and slowly developed the first sketch. Most of his input he took from the two oldest (L&R). Within a day or so, someone (not sure who) decided it was a bad idea to have multiple people contribute to a composite. So Morales sat down with the kids again and after a time, determined that Rebecca was the most artistically inclined, and the most observant of facial features. So, he did the final sketch from only Rebecca. When done, all the kids looked at it individually and agreed that was VERY close to the man they saw on that night. Stupid question probably, but have the Robbins kids been shown pics of Arthur Leigh Allen or Earl Van Best Jr. Or any of the other suspects to see if they can identify any of them as the killer? I have never seen any reference to whether the Robbins kids have Gary, I can only assume since they are integral to the case they may have been shown Arthur Leigh Allen and possibly others in the following years, as was Michael Mageau at the airport in 1992. But as for recent suspects such as Van Best, Gaikowski etc I highly doubt it. A facial memory from 47 years ago is really not going to particularly advance the case and likely not accurate. If the police took a suspect seriously, they have a partial DNA fingerprint to either eliminate them or not. My guess is that would be their first port of call. Continued......This is the best info taken directly from the kids themselves, albiet, some 40 years later. Both kids (L&R) are remarkable people. Rebecca is a fashon designer in S.F. (artistic eye) and Lyndsey is a successful building Contractor in Marin County. The problem with hypnosis is it can often bring up false memories. You hear many stories of children disowning their parents, accusing them of sexual abuse, and recalling these memories under hypnosis, while in a suggestible state, yet no such abuse happened. There are cases though when people have recalled such things as forgotten license plate numbers, but as an investigative tool for discovering only cold hard facts, I would give it a wide berth. It is by no means certain what the three teenagers recalled on October 11th 69, is actually what really happened. They stated Zodiac had Paul Stine's head in his lap. Does this sound right to you Mark. Imagine you are going to shoot a taxicab driver in the head and take a piece of shirt. Having just shot him in the head and he is bleeding heavily, would you place his head in your lap and purposely get smothered in blood, knowing you have to leave the scene on foot. He could easily have taken a piece of shirt just by leaning over Paul Stine. I know Zodiac was a psychopath, but he surely had no intention of getting caught, which smothering yourself in blood may have hastened. Interesting information about the kids there.. I never knew their identities had ever been made public.. As I mentioned earlier on facebook, I know they spoke to the writers of "Zodiac" in 2006 or whenever to give their take on the shooting..
You could argue the police knew the man on Jackson Street was the killer, so I cannot understand Armond Pelissetti stating in the documentary "I don't believe it was Zodiac." This on the face of it seems an absurd statement, after all Fouke and the 3 teenagers virtually concurred on the composite sketch, with the only deviation being Fouke saying he was "older and heavier". Furthermore why would Pelissetti sign the police report, that clearly had Fouke's description incorporated into it, if he didn't believe the man on Jackson Street was the same man who left the cab. He is putting his name to something he doesn't believe in. Anyway Fouke should have signed the November 12th police report, he was most pertinent to the sighting. If therefore we believe that Fouke had no input into the police report, then in the space of 8 hours, the teenagers have leapt from a low estimate of 25 years to early forties just like that, and if that was the case you just wonder how much external influence coaxed them into such a change, if not Donald Fouke's description. I actually don't believe the memorandum was the direct statement of Donald Fouke, what trained and decorated police officer would say of Eric Zelms "I do not know if he saw the subject or not" What a ridiculous line, when you passed the unknown white male, with your partner by your side. Correction; Above should say October 12th police report. What I can't understand is why they didn't get Fouke together with a professional artist once it was ascertained the man he saw was in fact the Zodiac. One laments the loss of this opportunity-a sketch of the retreating Zodiac; full-figure, clothes, warts and all, described to a good artist by an excellent observer. I've always said Gene, I couldn't understand why both the teenagers and Donald Fouke were not independently asked to create a composite sketch. Had they then matched closely, it would have given much greater credence to the likely accuracy of the sketch as a whole. However this opportunity was lost and all we seem to have is Donald Fouke either agreeing the sketch is similar to his observations, only a little "older and heavier," which inherently is not as convincing. "Palesetti followed a different path East on Jackson in the event Z had turned East. What happened next is for another story. " What Happened after Armond went after Z, that is not for us to know here today. Again, I could ask "Why is that?" but what logical, yet admittedly theoretical, cause or or reason would this witness possibly have for stopping the story Richard exactly at a point where Armond and Donald are imminently about to encounter A White Male Adult, the witness account stops with Armond going after suspect, which coincidentally is exactly the point in this saga where the stories, accounts, the versions thereof and lies and amendments begin to rear their heads. As I said, I've heard the story myself, albeit by what is legally defined as hearsay, that tells of police stopping and exiting to speak with a White Man for a short time before the cops open their rear crusier door, the Unknown WMA gets into the rear back seats, and the cops get back into the front driver & passenger seats and drive off in a direction going away from the crime scene. Is this true? Can't claim to know the answer to that question but I will say this, the witness declares the next sequence of events are for another time on another day and this sequence will actually be the truth and real version of what did truly happen that night, the thing that I have long believe is the same 'thing' SFPD are covering up. I mean nobody can make the argument and do so realistically of: "Nothing happened after this point in the witnesses story" because I will argue until I can argue no more that this witness clearly hints strongly here that they know what unfolds after the point of the strory here where they abruptly cut their story off just at the point where it will get interesting! If I knew nothing of what subsequently occurs that night I would never state that "What happened next Richard, well, I shall tell at another time..." You would assume Rich, would you not, that by that being my statement to you, I am telling you I know ad am aware of what happened after this point where i stop my account when posting publicly, surely? I am sat here trying to decipher why, all these years later. this witness still will not go beyond that point of public already knowing but not beyond. Rich, serious now, putting jokes and stuff aside, you have several times issued me a "Alex, Answer me this very serious question..." and I am returning the favor Rich and I am seriously asking you to please tell me why this witness is still unwilling, reluctant and silent about what they know happened and what they discovered on or near to Jackson Street? Nearly half a Century Rich and still, it seems fear, intimidation and even possible threats to keep their mouth shut are in play and still valid it would appear. If "What happened Next" is completely non sinister, not involving names that are known to us already lets say, why the fk is this guy too reluctant to say what happened? I can almost Hear Bettye Harden screaming over my shoulder..."I tried to tell you that Alex, the reality of what was discovered on Jackson Street that night if it were know.....It would, as I stated all them years ago, shake the Earth itself! I believe the answer lies in that well known line from the memorandum, with Fouke supposedly recalling that night "I do not know if he (Zelms) observed this suspect or not." You have to suspend reality if you believe Donald Fouke composed this line. Donald Fouke described the suspect right down to his boots, which showed he was curious of the unknown male and at some point the man would have become less visible to Fouke as they supposedly cruised alongside. At which point Eric Zelms had a direct line of sight. Are we to believe Donald Fouke never addressed Eric and said take a look at the man on the sidewalk. Are we to believe when he met Armond Pelissetti and said "oh that was the suspect," Eric said "what suspect" or they never concurred at all in the following month and Eric Zelms had no input into the composite sketch. "I do not know if he (Zelms) observed this suspect or not," well bloody find out, it surely is critical to bring another person into the equation when formulating the composite. When Fouke is driving down Jackson, it makes more sense for Fouke to be scouring the south side of the street and Zelms the north, but certainly Zelms was closer to the sidewalk no matter. Clearly Zelms was shielded from the limelight in what was inherently a failed stop and search. We pretty much know the white male (Zodiac) was stopped, the question is why was he not detained. I don't think anything sinister occurred here, other than considering time a premium, when directed to a possible guy waving a gun, the cops bought it hook, line and sinker. "and I am returning the favor Rich and I am seriously asking you to please tell me why this witness is still unwilling, reluctant and silent about what they know happened and what they discovered on or near to Jackson Street?" What witness are you referring to Alex. "Are we to believe Donald Fouke never addressed Eric and said take a look at the man on the sidewalk. Are we to believe when he met Armond Pelissetti and said "oh that was the suspect," Eric said "what suspect." DF: The One that went up the steps at the Intersection back there!" EZ: Intersection? Man on steps? I apologize Armond but it seems my partner has been supping on the LSD again and seeing things"
No but serious, that is my point all along when I have told you I honestly believe that the SFPD know something that they don't want us to find out. I think Rich they know (SFPD Chiefs anyway) who it was on Jackson that night and who Z likely is. We have four crime scenes, many witnesses especially at LHR in the general area who never actually witnessed the homicides nor observed the suspect and yet these are all asked, and agree, to come in and give official first hand statements. Skip to San Fran and Z's last confirmed murder and here we have in this instance witnesses who actually saw the offender at the scene, and they are asked to help with a composite yes, but not to give official statements of what they saw and know of what happened that night? Instead we Have Pelissetti seeming to speak for His colleagues and the Witnesses alike! He will give us Don Fouke's description of the suspect because Don doesn't do reports it seems and also, Armond tells us third hand accounts on behalf of the first hand witnesses & what it was they observed." I been thinking what type of suspect would cops see, speak to, and let Him on His way without any question? There is only really one answer I can think to that question......A fellow Cop of considerable rank aka above the patrol cops own. This certainly would explain a subsequent cover up if the SFPD knew Z was one of their own. Imagine the scandal, the damage to the Dpt, especially in that era of Anti-Establishment, would be fatal. I ask you to read and look at all pictures of Ross Sullivan. He had a brother Tim and brother Jon. All were in that area. BEST GUESS IT IS ROSS SULLIVAN on that murder. THIS WAS ONE BAD FAMILY. Only Jon may still be alive and still lives in that area. GOOD LUCK!